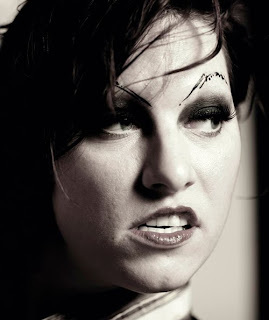 ^ Amanda Palmer is the one exception to this diatribe because she's talented and lovely. Eyebrows are inherently kind of odd and, as far as I’m aware, only serve purpose in articulating and exaggerating facial expressions. They’re a key facet of comical faces that are, in any other context, ever so slightly distracting. But, just like ears, everyone has them so they don’t look weird (come on, ears are pretty bizarre – if we didn’t all have them, we’d be pretty frightened by those fleshy craters). Occasionally, they’re a bit bushy or inter-connected but that can be remedied quite easily. My Indian hair-itage (see what I did there?) has given me amusingly blunt eyebrows and I’ve learnt to live with them, but I can understand why people might occasionally get a tad self-conscious about their own. However, shaving them off and drawing them back on is not an appropriate reaction to brow-based dissatisfaction. No matter how quirky your eyebrows are, they will always look like eyebrows. Drawn-on (or worse yet, tattooed) eyebrows do not look like eyebrows. They don’t leave much to the imagination – it’s blindingly clear that you shaved off your eyebrows, grabbed the nearest marker and drew a thin black line, even if your hair isn’t black. I don’t understand how anyone would expect a pen-line to be an effective surrogate for real eyebrows – there’s no hair, it’s completely flat and the fake-brow simply doesn’t move with the eyes the way a normal eyebrow would. Also, you either end up with a freakishly smooth elliptical curve or violently triangular Thomas the Tank Engine eyebrows. You lose all the expression that comes with normal brows and create a hideous caricature of your own face. On your face. If you’re going to shave off your eyebrows, why stop there? I say you should just start shaving your head and drawing on new hairstyles. It has the same aesthetic value after all. I’m pretty sick of the maintenance that comes with having a light beard, so I’m going to shave it and draw stubbly dots with a biro. Might draw in a jaw line whilst I’m at it. Oh, I’m definitely adding a badass scar over my left eye. After all, apparently ink is an effective way to deal with facial flaws. Except it isn’t. Shape your eyebrows all you want, but don’t shave them unless you want to look like Pete Burns. I would wager at this point, even Pete Burns doesn’t want to look like Pete Burns. Also, what if your pen runs out? Would you just spend the day wondering around with no eyebrows? I imagine girls in this situation probably have some kind of contingency plan for such emergencies, but I’m secretly hoping they just panic, grab a red pen and hope for the best.